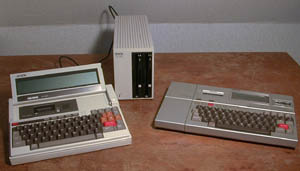 Front The TF-20, with the HX-20 option installed, brought floppy disks to the HX-20 machine. 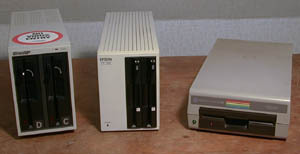 The disk drives are the same as the QX-10 devices, and even the disk format is identical. Note however that the drives type is SD-320, which is a SD-321 (as in the QX-10) but with a Head load selenoid. Here a movie of the head positioning voice coil. The floppy and the head are on the left. The TF-20 is a peculiar device in that it contains a complete computer system that boots from the disk. It is Z80 based, has 64 kByte RAM (not a trival amount in 1982! ), a boot PROM, serial interface and floppy controller (µPD765A). Once the OS, 'TFDOS' is loaded, it can communicate to external devices like the HX-20 or PX-8. There is no console connection to check booting has succeeded, but if the drive A is repeatedly accessed, assume booting has failed. A succesful boot accesses the disk exactly three times, where there is a short pause between the first and second time. Hard to explain in words, so I made a movie. Back The basic TF-20 contained just two floppy drives and a power supply. With the flat cable connector, the unit could be used as extra drives with a QX-10. Only with the HX-20 factory option installed, it became an intelligent disk station to be used with the HX-20 and later the PX-8 and PX-4. 40 track double density, 16 sectors of 256 bytes per track/side. The disk geometry is identical to that of the QX-10, so the first four tracks are reserved for CP/M CCP, BDOS and a large BIOS. Track 4 is the directory and track 39 is not used. This leaves 278 kByte per disk for use data. A system disk, containing BOOT80.SYS (TF-20 boot file, also referred to as TFDOS) and DBASIC.SYS (HX-20 Disk basic extension) has about 8 kByte less space. to The TF-20 works equally well with the HX-20 as with the PX-8 as both share the same baudrate and serial protocol. The commands used however differ; the HX-20 retrieves and stores files, the PX-4/8 operates on sector level. For connection with the HX20 you need Cable #707. For the PX-8 use cable #723.
devices The TF-20 is in functionality comparable with the Commodore 1541 disk drive. Local intelligence and a serial interface with the host system. 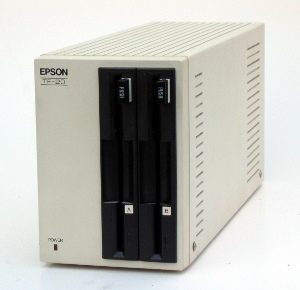 The Sharp drive looks similar but lacks most logic: it only has a floppy controller on board, and is a parallel I/O device for the host computer. HX-20 boot disk image Contains TF-20 boot code and HX-20 Disk Basic extension. 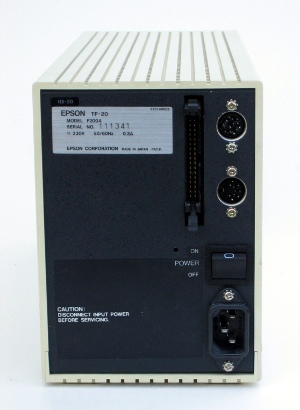 Epson Serial Protocol used between TF-20 and HX-20, PX-8, PX-4.